I know I haven't blogged in a long time, but I haven't really knitted in a long time either. School has been really busy, and I'm lucky to even get a few rows in while I wait for classes to start. So sad, I know. But here's a tidbit of what I've been up to at school, it's a video project in which we were given a bunch of random clips filmed straight from the television. There were clips of Hitler, WWII footage, Civil Rights footage, and a lot of really bad modern commercials. We edited on imovie and could only use audio from imovie and the clips we were given. I'd love to get some feedback on it since this stuff is totally new to me. *just a note: the video is extremely compressed for web viewing...it wasn't that pixelated to begin with! This week was a very exciting week for me because I started my first semester at my new school. It seems like I've been working up to this forever, so it was really great to finally be there! I think that it's the perfect fit for me, and already I'm blown away by the differences of attending such a small school as compared to the big ones that I've been to in the past. Everyone there has been really welcoming and supportive so far. I also got my new computer this week! My school is Mac based, which meant that in order to be on the same page I needed to make the change and dump my little PC. It was kind of terrifying actually, which is apparently really funny to people because Mac's are supposed to be so easy....but I've got to say that I have had some difficult times with Mac's in the past. But this time, this new laptop of mine is my new favorite thing! It's shiny, it's got a huge screen, and so far it's been great. I think we'll be friends. In other news, our wedding photographer emailed me a couple of weeks ago to tell me that she is going to start making custom wedding albums to offer her clients. She chose our wedding as a sample which you can view here by clicking on "albums" and then "Ginny and Matt". The online view is simply a layout, but she had the real book leather bound in Italy. I just thought it was great to revisit our wedding photos, and I love the way that she grouped the photos together. Heather has an innate sense of each tiny detail that was important to us, and she included most of those moments and details in the book. She's going to come by the house to visit and show us the real album tomorrow afternoon. How nice is that?! I thought it was great. Mom's sweater caused the most stress. This was mostly due to the fact that I started it in June and then had to rip out all of my work when I realized that the yarn I was using just didn't work with the pattern I was following. I ended up making a seamless sweater because it was so easy to jump into and didn't require an exhausting pattern search. I like the finished sweater, and Mom says that it's the only sweater she's ever owned that didn't have sleeves that were too long for her. I'm just happy that it fits! I called her first thing Christmas morning just because I was so Handknervous for her to open it. This bag is for Pua, my sister-in-law. The pattern is from Interweave Spring 2006, yarn is Nashua Creative Worsted which I doubled and knitted with a size #13 needle. The bag is huge, but I loved making it. I made this at the beginning of the summer, which in retrospect was a very good idea. I just love this picture. I made these two aprons for Matt's Nana's using a pattern from Amy Butler's book. The fabric is from Japan, but I bought it at Satin Moon Fabrics here in SF. I wish I would have made one of these for me! This bathrobe was one of the more challenging projects, but I think it was a good learning experience. It fits Matt's Mom perfectly, and she was really excited about it. Now that I'm posting all of my hand-knitted gifts I'm realizing that in all of my rushing around before Christmas I forgot to take pictures of a lot of the things that I made. I guess I'll just have to tell you that I also made an Elf Cap from Handknit Holidays. (I'll definitely make another one of these.) And I sewed a log cabin pillow that turned out really nicely and was really fun to make. Oh well. Now that I'm back home I've got some cleaning up to do as well as some more knitting. I'm thinking that my unofficial New Year's Resolution is going to be to knit up some of my stash because my craft closet is overflowing with yarn and fabric. I've already gotten through about eight balls of yarn for a sweater that I started over the break...and I know that you just can't wait to see my sweater. I'm just to busy to blog. Maybe I'll come back to it once the holidays are over. Let me just begin this post by assuring you that I do love my husband Matt. This weekend Matt went out of town to visit some friends down in Southern California and as much as I thought I would miss him, I had the best weekend ever! There was no one to tell me to stop knitting and go to bed, I got to watch whatever I wanted to on tv (while knitting, of course) and I had all of my sewing and knitting paraphernalia spread out all over the living room. It was glorious. I'm taking a little break from Mom's cardigan because I think I want to rip out about five inches of the sleeve and do the decreases differently. I'm tired of making sweaters that don't fit, so I'm taking my time with this one. 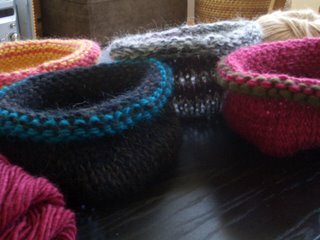 In the meantime I have gone through my huge yarn stash and collected all of the wool scraps and leftovers that I have and put them into bags so that I can mix and match the colors and make some felted bowls. The felted bowl pattern in One Skein is quite satisfying in that it is really quick and easy and with a great result. I have this funny feeling that everyone on my Christmas list will be recieving a felted bowl...just a feeling. Especially since I was able to crank out two bowls per night. My other craftiness from this weekend is a little dress I made for a friend's new baby girl. Matt was actually down visiting them, but I just couldn't get this done in time for him to take it. 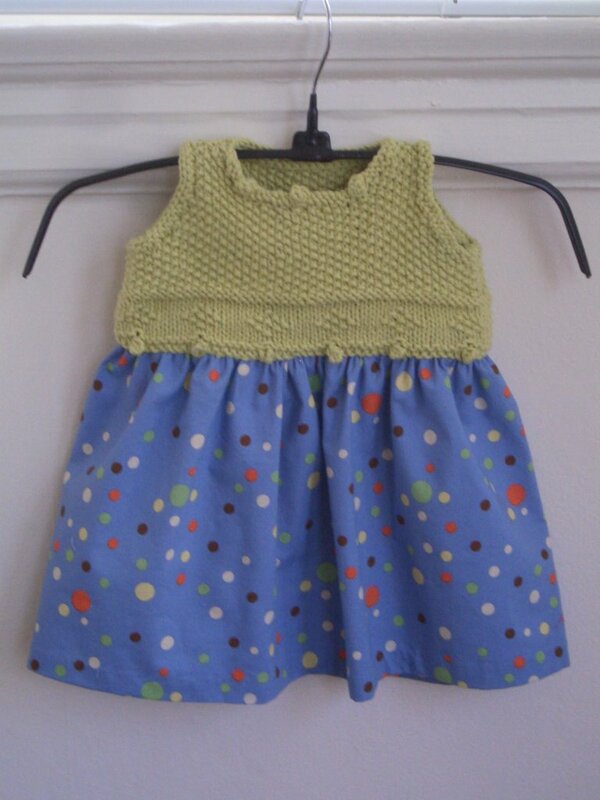 This pattern is from Melanie Falick's "Knitting for Baby" book and I think it is just so cute. I used Rowan All Seasons Cotton for the top, and the fabric is Michael Miller, Party Dots. It's all about the machine washable baby gift. It felt so great to get these things done this weekend. I've been feeling kind of guilty about the amount of yarn I have in my stash, so I'm trying to make it a priority to use a good bit of it up. There's some good stuff in there! I have twelve skeins of cashmere to make a sweater...now all I need is for Matt to get out of here and leave me to my knitting! I'm feeling kind of dorky, because it's two months from Thanksgiving and already I can't stop thinking about it! I always thought that Christmas was my favorite holiday when I was a kid (the reasons for that are obvious) but now that I'm an adult I have officially decided that Thanksgiving is my most favoritist holiday. When I moved to San Francisco I was kind of sad to think of spending the holidays away from my family and so to deal with that we began to make our own traditions and invite other friends who don't have family here to join us. 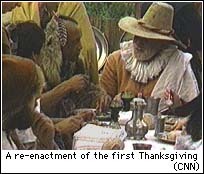 The result has been some great Thanksgivings, my favorite one being a costume party where everyone had to dress up like pilgrims and indians. Although every year has been a fun celebration with great food, wine, and a bunch of friends. This year my friend Syrette is coming from New York along with my sister and her new boyfriend and we'll also have a few other friends that live here in SF. I'm still deciding what kinds of desserts I'm going to make to supplement our homemade pumpkin pies...but I guess that I've got plenty of time to figure that out. Since I spend way too much time reading other people's blogs I decided to share in the fun and have my own. I don't know that anyone really cares to read about my life as a student or my sporadic knitting obsessions...but my big ego really wants to think that my life is interesting enough to post on the internet. If you do happen to stop by, please say hello by leaving a comment. I always wonder who is bored enough to read my posts! Ruffles scarf from "Scarf Style"
Knit 2 Purl 2 Hat by me! This is a Flickr badge showing public photos from GinnySF. Make your own badge here. Don't forget, all the cool people comment!